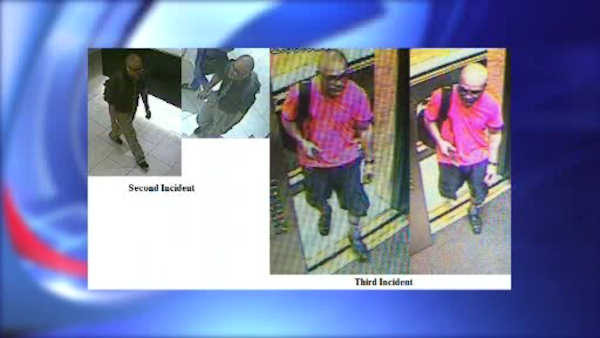 MIDTOWN MANHATTAN (WABC) -- Police are looking for a man accused of stealing from at least three hotels in Midtown Manhattan. Security cameras recorded the suspect, who investigators say broke into guest rooms and offices at the St. Regis, the Broadway at Times Square, and the Palace Hotel. He has allegedly taken cash, wallets and electronic equipment from the hotels over the past year and a half. In one burglary, police say the suspect was found inside an unlocked guest room by hotel employees. As the staff began to question the suspect as to what he was doing there, he then fled the location. Two months later he was seen once again, wearing the same clothing, inside the hotel and when questioned about what he was doing there, fled the location. The suspect is described as 5'5" to 517" tall, weighing 160 pounds. The suspect wears glasses and is bald.